Will a surveyor tell me what property I own? Below, we have tried to answer some of the most common questions visitors ask about surveying. If you find that your question is not answered on this page, please email us at info@summitlandsurveyors.com or call us at (503) 928-5589. We truly enjoy our profession and are more than happy to educate the public on our service. Land Surveying, per the American Congress on Surveying and Mapping (ACSM), is the detailed study or inspection, as by gathering information through observations, measurements in the field, questionnaires, or research of legal instruments, and data analysis in the support of planning, designing, and establishing of property boundaries. It involves the re-establishment of cadastral surveys and land boundaries based on documents of record and historical evidence, as well as certifying surveys (as required by statute or local ordinance) of subdivision plats/maps, registered land surveys, judicial surveys, and space delineation. Land surveying can include associated services such as mapping and related data accumulation, construction layout surveys, precision measurements of length, angle, elevation, area, and volume, as well as horizontal and vertical control surveys, and the analysis and utilization of land survey data. Surveying has been an essential element in the development of the human environment since the beginning of recorded history (ca. 5000 years ago) and it is a requirement in the planning and execution of nearly every form of construction. Its most familiar modern uses are in the fields of transport, building and construction, communications, mapping, and the definition of legal boundaries for land ownership. Typically a licensed land surveyor is required to sign and seal all plans, the format of which is dictated by their state jurisdiction, which shows their name and registration number. In many states, Oregon being one of them, when setting boundary corners land surveyors are also required to place monuments bearing their registration numbers, typically in the form of capped iron rods, concrete monuments, or nails with washers. Generally, it is difficult to provide an exact amount for the price of a survey. There are many variables that can affect the cost of a survey. Depending on the type of survey requested, we may have to coordinate with engineers, planners, title companies, and contractors just to name a few. We will likely have to research public records, contact title companies, and possibly interview local residents. We will make every attempt to provide you with an accurate estimate of the project, prior to beginning any work. However, since there is only so much we can anticipate up front, unforeseen circumstances can arise, which makes an exact price almost impossible. Remember when choosing a surveyor to ask exactly what they intend to do for you for the price they have quoted. If you are trying to compare fees, you need to know exactly what you are comparing. There are many things disclosed in a title report, many of which do not pertain to surveying. However, a surveyor generally will want to see a title report because it will disclose any easements and property rights that may exist on the property. When we are surveying a property to define it’s boundary, or building space, we will require the vesting deeds for your property, as well as those of your neighbors. A single piece of property is like a puzzle, in that it fits in between other properties. In order to see how your property fits, we need to see how the neighbors fit as well. The deeds are a written document that describes your land. The title company will provide these deeds to us along with the title report so that we can properly resolve your boundary. These records are available at the county, however, only a title company has the tools to properly research and assemble all the deeds necessary to get a clear picture of your property and the easements that may exist on it. There is a fee associated with a title report from the title company, but using their tools and being their area of expertise, their fee is generally lower than if you attempt to do all the research on your own. There is also a guarantee that comes with that fee. No. A surveyor uses the deed for your property to resolve your boundary, and give you their professional opinion of your ownership. However, if problems are discovered such as neighboring gaps or overlaps, structural or use encroachments, or other problems, the surveyor can assist you in resolving the conflicts. Typically, a conversation and cooperation with the neighbor to adjust the property line, or create an easement is all that is necessary. If that course of action is unsuccessful, the problem may need to be brought to a court of law. This action being the most expensive solution. 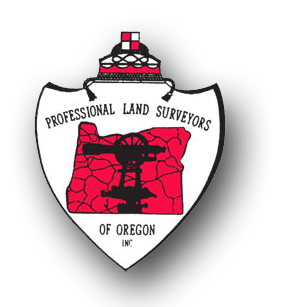 The Professional Land Surveyors of Oregon have put together some great unbiased information for the public. They also have a very nice brochure to answer many questions pertaining to surveying and in selecting a surveyor. To see this brochure, just click here. The Art of Surveying. While one might assume that the manipulation of property and numbers might be devoid of art, only the contrary can be true. Many properties have considerable problems with regards to improper bounding, miscalculations in past surveys, titles, easements, and wildlife crossings. Also many properties are created from multiple divisions of a larger piece over the course of years, and with every additional division the risk of miscalculation increases. The result can be abutting properties not coinciding with adjacent parcels, resulting in hiatuses (gaps) and overlaps. The art comes in when a surveyor must essentially build a puzzle with pieces that do not exactly fit together. In these cases the solution is based upon the research and interpretation of the surveyor, and following established procedures for resolving discrepancies.